The Chairman, Academic Staff Union of Universities, NSUK chapter, Dr. Theophilous Lagi, has revealed that barring a last minute intervention from stakeholders, plans have been concluded, awaiting the nod from the National Executive Committee (NEC) of ASUU, for the union to proceed on an indefinite strike because of the refusal of the Nasarawa State Government and the university management to implement the agreement reached with the union. institution if something is not done to avert it. Comr. Lagi disclosed that the contentious issues are very fundamental and must be tackled if our educational system must improve. Noting that, apart from a backlog of unpaid earned allowance, the government is yet to release the white paper of a visitation panel to the university on NEEDS assessment. attitude on the part of the state government and the university administration, we have no choice but to close down the university”, he said. He however refused to revealed the date when the strike will commence, saying they are waiting for a formal directive from the national office of ASUU. “Nothing is dependent on us yet. We have to wait for the outcome of the mandate that will be given to us by the NEC of ASUU to close down the university”, he said. Lagi also did not disclose when the NEC will be meeting to decide on the issue. Meanwhile, Dr Lagi said, ASUU is reluctant to embark on the strike which is why they are engaging every stakeholder to see the possibility of averting it. He acknowledged the negative impact the strike will have on the system and reminded every concerned individual to intervene because, according to him, “it will be very extensive”. 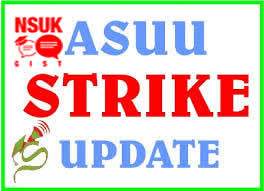 He also stated that the strike will be indefinite and the possibility of calling it off soon may be elusive and reminded those who may have forgotten the nature of ASUU strikes that. suspending it is another thing”, he added. He however refuted the allegation that ASUU want to adopt strike action instead of dialogue to resolve issues. “We are going on strike reluctantly. It is not in our blood, but you know this demand has been lingering and there have been series of breaches. Nobody wants to see what the other side is doing; it is all about ASUU is going on strike but nobody wants to take an in-depth look on how patient we have been all along. We are not doing this for just our pockets; we are doing this for the quality of education”, he said. Dr. Lagi took a swipe on students who he said are only concerned about graduating soon but not the quality of education they are getting. “One thing with students is that they just want to graduate; they don’t want to give a damn on the future and quality of education. This place is an institution, people come and play their roles and leave but what about the quality of education? The indiscriminate admission of students—the semester is rounding up, lecturers have finished their classes but they are still bringing list of admission, who is going to teach them, where are you going to place them, what kind of quality education are you going to give them?”, he queried. He further admonished students, as stakeholders in education to also appeal to management to fulfill the agreement with ASUU, as it is the only way to better the quality of education in Nigeria. “This thing is a sacrifice. Nobody wants to talk to the management. I don’t know how many students who have organized themselves to go and talk to management to see how this strike can be averted. We are not supposed to be doing this on your behalf; you are supposed to do it for the future of this country. “Students get killed off-campus because there are no befitting hostel accommodations and you are forced to stay in Angwa-Lambu, High-Court and the rest, and mix up with all manner miscreants that are not students. Are your libraries well equipped? Why are all those things not provided, nobody is asking those questions. Not that they don’t have the money but they don’t give priority to education”, the ASUU chairman fumed. He noted the fallen standard of education in the country has made some parents to send their children and wards to neighbouring West African nations of Ghana, Benin Republic and even Togo, where he said, their educational standard have bettered that of Nigeria, in spite of the huge natural and human resources at Nigeria’s disposal. While also questioning the inability of Nasarawa state government to take responsibility in repositioning the infrastructural deficit in the university. have been possible”, he said.